Today our own Julie Gottlieb features on BBC Radio 4’s Womens Hour talking about her upcoming conference: Rethinking Right-Wing Women. 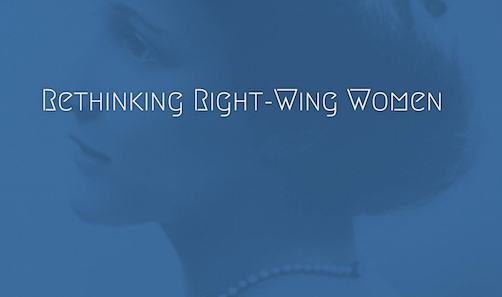 This two-day international conference explores the relationship between women and conservatism since the late 19th century. In the media frenzy and the re-enactment of the visceral political divisions of the 1980s that greeted the death of Margaret Thatcher in April, 2013, it soon became clear that Britain’s first woman Prime Minister was being portrayed as an aberrant figure who had emerged from a party of men. It appeared that the media and the public had not been well enough served by academics in making sense of and contextualizing the Thatcher phenomenon and, more broadly, the paradoxical sexual politics of the Right. In many respects– from the foundation of the Primrose League in 1883 all the way to the 2010 so-called ‘Mumsnet’ election — the success of British Conservatives to organise and mobilize women has been ‘exceptional’. In the weeks after the General Election, we will come together to assess the British Conservative Party’s gender politics, and rethink right-wing women as political leaders, activists, organisers, and voters. This entry was posted in News and tagged BBC, BBC Radio 4, Conference, gender, Gender History, Julie Gottlieb, Media, Political History, politics, Women's Hour on June 26, 2015 by James Pearson.